An artwork about privacy using live CCTV camera feeds from inside the building and broadcasting it all outside to create what Stanza calls a parallel reality." 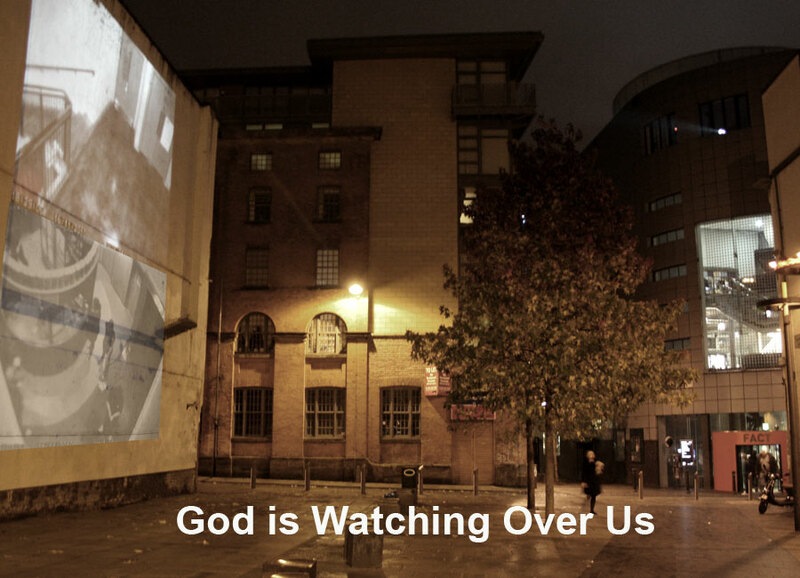 The artwork "God is Watching Over Us Outside In the Panoptican", continues the series of investigations into the uses of surveillance to extend space and invoke impressions of transparency with architectural and public domain space. This artworks extends the architecture of the building into the city. The artwork includes the performative aspect of those being watched as they are be displayed inside the artwork and there is no privacy within the context of this space. The public are embedded into the "information stream" of the artwork so that they become the artwork. There is no knowledge of this process where the invasion of privacy is the made public. The resulting experience becomes a real time artefact, the work is always changing, never the same again always different forever. The focus is the live dynamic interpretation of the space and the people both inside and outside. CCTV systems are everywhere in the public domain. We are all actors, bit part actors, in a giant movie called life. Except we cannot watch, it is not on public display and the results are monitored, filtered and distributed without our permission. This artwork puts the public on public display. 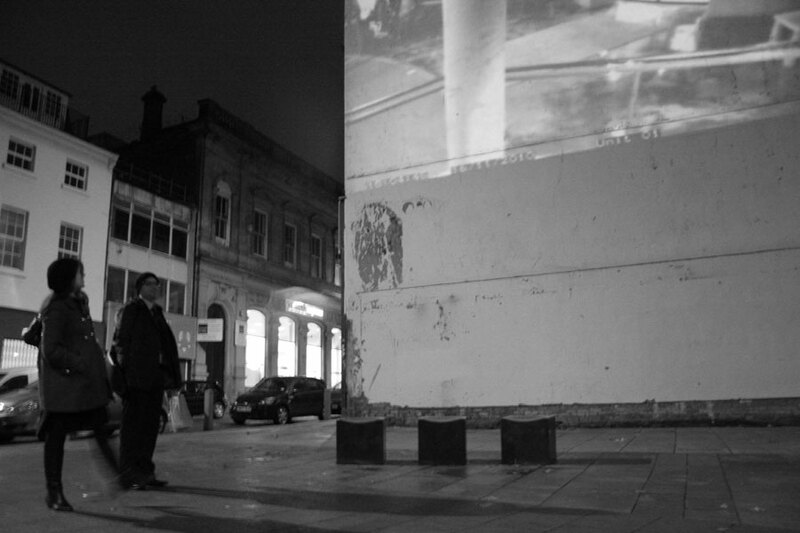 The surveyed public as everyday actors are displayed using giants screens in public space, ie within the public city. To use the building the networks are part of and re-represent the building. All the imagery from the inside of the building is used to make the artwork on the outside of the building. The display device for the networked data infrastructure is the building itself. This work opens out the networks of CCTV and manipulates these images creating new and hidden narratives in the process. Artwork functions: Transparency of space; ownership of data; and problems of representation and privacy. How. Use of Live embedded real time CCTV. Any Building and its interior space. Public Domain III is an artwork about the surveillance of public domain space utilzing the CCTV systems in place and manipulating the CCTV feeds. 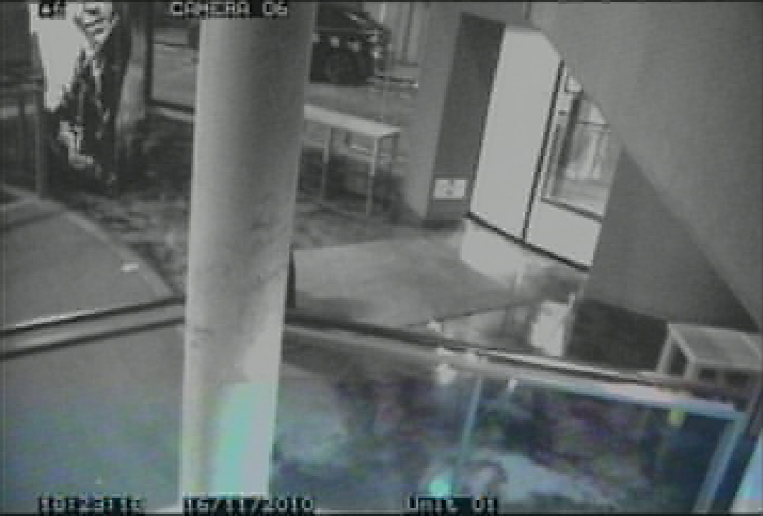 Using the CCTV of the building to create a new relationship with public domain space and the architecture of the building. This artwork, "God is Watching Over Us Outside In the Panoptican "questions who owns the data space and who is watching us in these spaces. 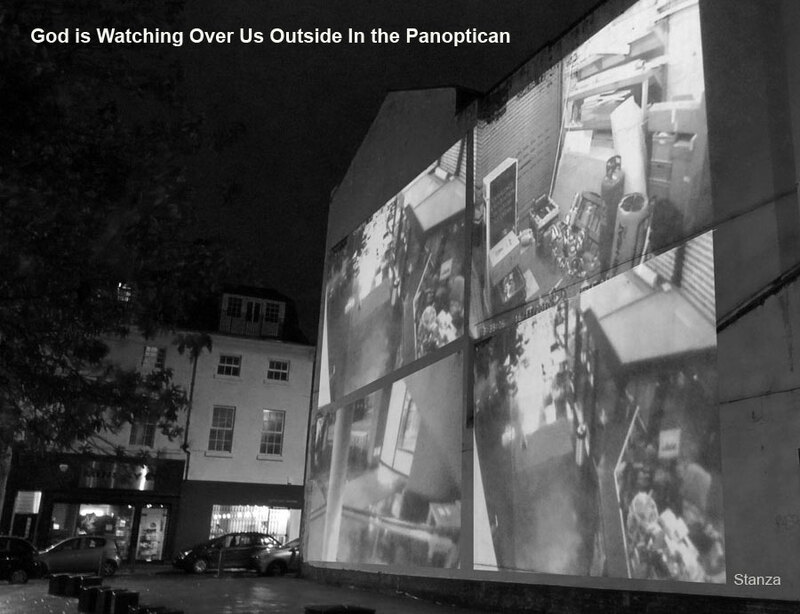 Most buildings have surveillance and CCTV systems and they use it to observe the people inside the space, ie the public. By appropriating the real time analogue and digital surveillance feeds my aim is to reclaim the data space from private to public domain. 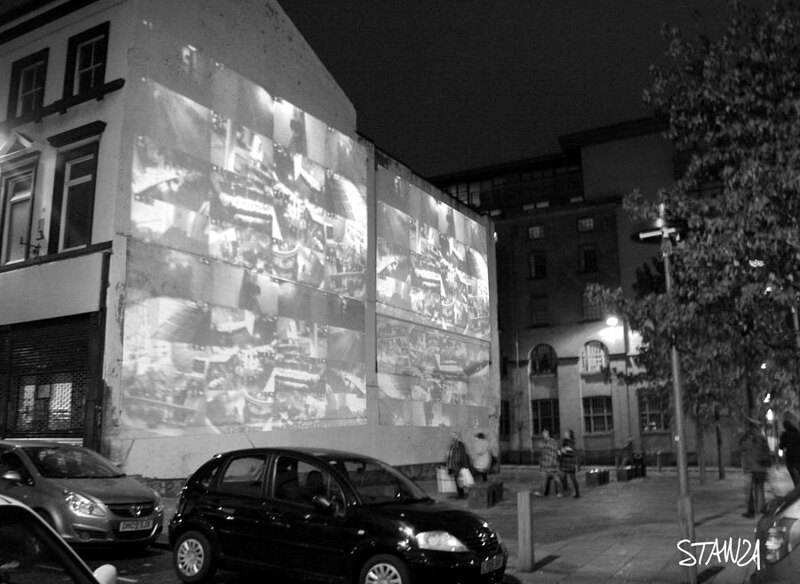 All the resulting surveillance network is projected over the the city creating new narratives from what is happening inside. The city becomes a huge display system. The city space and the physical body is represented as a huge display. By doing this one also makes the building transparent and opens up the architecture and the networked space. In this artwork I used the surveillance technology in the building to broadcast all the information outside into the public domain. This makes the building a giant broadcast TV station. The information no longer becomes private, it is opened out, and is not longer privileged, it is transparent. The data although observable by everyone ie, everybody in the whole world is watching you, is also available to be owned by yourself ie, the public. The public are the owners of the data they make. In fact the public are the data inside this space. The body reclaims the data space. 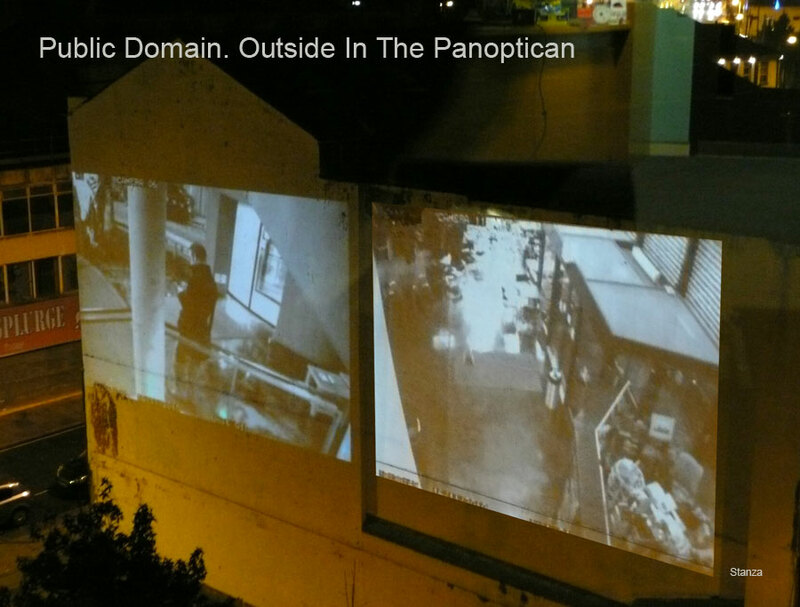 The series of artworks "publicity" and "public domain" are socio-politcal cultural artefacts, that create real time images with the systems that are used in everyday surveillance, that are in deployed inside the 'public' building. The work fuses the inside space, and the outside of the space, and the real time data of the body and the data of the surrounding environment. This system allows the public to be in and engaged within a 'parallel reality'. This is an observation of the self within the context of the continuous stream of data that surrounds us in this case accessing the buildings own surveillance. The images are sensory illusions of a data space with the body firmly placed in the centre. They are rendered real time films, ie real time unfolding environments. This is a syncronous unfolding of reality from multiple perspectives. These images unfold as real time impressions of the internalised space. The work can be adapted to be a memory space a bank of memories by fusing the recorded data with the real time footage. A real time memory space, a psychometry or the architecture. This new 'Psychometric architecture' becomes a techno space or surveillance embedded in the space capturing the total environmental experience. The walking, talking, moving is merged and reconfigured and replayed as seems fit. The reconstructed space thus becomes a gallery a global panopticon an all buildings could be linked together this way.